LibCal 2.15 Release Coming Soon! The LibCal 2.15 release is on its way to you this week, and will be rolled out to all regions by the end of the day Thursday May 17th. We have tons of goodies to share in this release, including a brand new Card View, plus new filter layouts for upcoming events, and several GDPR related updates. Read on to learn about all the great new features coming your way this week! 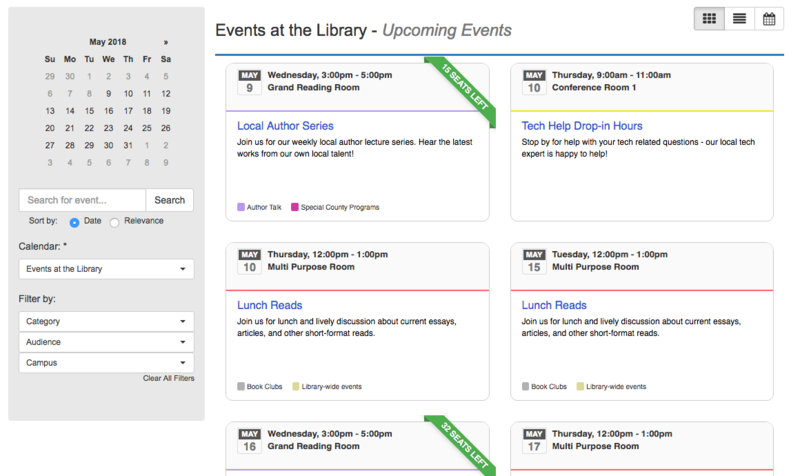 Card View – We’re introducing a new “card” layout to show your upcoming events in style. In this new view, each event is represented as a card – the event’s date, time, and location are displayed at the top of each card for easy scanning, and each event’s title and description are displayed inside the card, with categories and audiences displayed at the bottom. This new layout is integrated into all public calendar views, so your patrons can switch to the view that works best for them with just a click. Flexible Filter Layouts – With such a lovely new view of upcoming events, we realized it would be great to get even more flexible – we’re introducing a new display option so you can choose whether your calendar event filters display on the left side of the screen (as in the above screenshot) or across the top. This new top view for filters gives the various event layouts much more room, and works a treat for mobile users. To choose the default view and filter layout that works best for you, admins can head to Admin > Calendars > Settings. Good to Know: In order to make these new features possible, we had to centralize the Calendar Display templates at the system level vs. individual calendar-level. It used to be possible to customize the monthly view and list view templates for each calendar, via Calendars > Edit Calendar > Settings > Display Settings. Once the release is live, these templates will no longer be part of individual Calendar settings, and will be located under Admin > Calendar > Settings with only a single template for each view (Event Listing and Monthly), which will apply to all calendars in your system. In addition to the great new event views mentioned above, we’re also adding a new classification option to help manage and view your events – Internal Tags are here! These optional tags provide a way to classify your events for internal statistics and data gathering purposes, and are never shown to the public. When events have been tagged with these new internal tags, you’ll be able to filter all statistical reports and booking explorer pages by this parameter, which makes it easy to view ex all of the events tagged with “New Ideas” or “Funded by STEM Grants”. To create Internal Tags, admins can head to Admin > Calendars > Internal Tags. Once these have been created, they will display on the Add/Edit Event page, in the Booking Explorer for each calendar, and in our super cool new Calendar Statistics pages. Data Submission Notices – We’re also adding an optional data submission notification, to help you alert your patrons to what personal information you collect in order to create a booking. This gives you an opportunity to let your patrons know why you collect particular data on registration forms, what that data is used for, etc. To turn on this notice and customize its text, admins can head to Admin > System Settings > Privacy Settings. Expanded Privacy Scrub – We’re expanding our current privacy scrub options so that now, in addition to scrubbing patron name and email address, you can also choose to scrub patron responses to all registration form questions. When the privacy scrub has been enabled, we still retain an overall usage statistic – so for example, if a space booking is being scrubbed, we retain the booking’s start and end time, but remove all identifying information about the person who created the booking. To enable the privacy scrub for your site, get in touch with our awesome support team and let them know which module(s) you’d like to scrub, whether to scrub just name and email or include registration form questions too, and the number of months for which you’d like to retain data (choose from 1-12 months). We’ve added an easy way to Migrate from Calendar level Categories to the new System-wide Categories and Audiences. We’ve added a new option to Transfer a Calendar-Level Category to the system level Category and Audience pages, so switching to the new system-wide options is a breeze – head to Admin > Calendars > Audiences/Categories to see it in action. In addition, if you delete a calendar level category (via Calendars > Edit Calendar > Settings > Categories), you’ll see an option to migrate existing events to the system level Categories and Audiences. We’ve updated the Add/Edit Event Page so all of the menu selectors have the same look and feel, and and all of the help text has been updated as well. We’ve updated the Mini Calendar Widget so that, if there are no events happening in the current month, the widget will display events from the next month. We’ve fixed a bug with editing a patron’s equipment or space booking – previously, if you were changing an existing reservation to a different date (both before and after the original booking date), the alert messages that check for booking clashes weren’t updating to the newly selected date, which could create incorrect booking clash notices. We’ve added the ability to Export Equipment and Spaces Statistics. We’ve updated the Equipment and Spaces public pages to better alert patrons when they attempt to create a booking that exceeds the amount of time they’re permitted to book. Previously we only alerted users to these issues after they had begun to fill out the registration form; now, we’ll alert issues as soon as they attempt to select timeslots that exceed what a person can reserve in a single booking, before they reach the registration form. We’ve fixed a bug that prevented selecting “User Showed Up” when a space reservation spanned days. We’ve made a number of accessibility improvements to the public MyScheduler Appointments page, so it’s easier for users with assistive devices to navigate the page and know that something has changed when they select a librarian, date, and time. We’ve fixed a bug with MyScheduler Appointment Categories that contained padding – previously, patron email confirmations weren’t taking this padding into account, but now they do. And speaking of MyScheduler, we are working on a major overhaul and tons of new MyScheduler functionality in the next couple of months. If you have ideas or suggestions about what you’d like to see in MyScheduler, please let our support crew know and they will relay the message to the LibCal product team. Hi Rob – Thanks for that suggestion! This is on our to do list and makes complete sense to add, we’ll make this happen in an upcoming update. Thanks again! Are Public Cookie Notice and Privacy Statement, Data Submission Notices and Expanded Privacy Scrub available for LibAnswers as well as for LibCalendar? Hi Roland – these are coming in LibAnswers in the impending release this week – they’ll be available by Friday at the very latest. Thanks for your question! Thanks Sarah – that’s great. I see them now. I am also wondering when we will see similar changes within Equipment & Spaces? We are due to migrate next week and I can’t see any similar settings there.